Stencil portraits created by youth in Richmond's juvenile detention center, part of Art 180's Performing Statistics program. Advocates and state leaders are making progress on changes to Virginia’s juvenile justice system, which includes laying the groundwork to build community-based alternatives that offer a range of support for children and families. The momentum to establish alternatives is being driven by a diverse coalition, including formerly incarcerated youth. In the first of a two-part series, Catherine Komp has more for Virginia Currents. Join the Conversation: See more artwork created by teens in Art 180's Performing Statistics initiative and join the conversation by tagging photos, tweets, and your responses with: #MoreThanStats . Learn More: The Department of Juvenile Justice is accepting comments on the Interim Task Force report through Septembe 30th. Read the Annie E. Casey Foundation's on Virginia juvenile correctional centers. Find out more about the RISE for Youth Coalition and Performing Statistics. Twenty-two-year-old Marvin Brown recently spoke at conference at Georgetown University. Marvin Brown: It was really amazing. I felt like a rock star when I got off the panel. People were there from all over the country. After Brown’s panel, he got handshakes and hugs, people thanked him for what he said. Brown: That was an awesome feeling, sharing my living experiences with other people and help them change their living experiences. This was a big deal. A few years ago, Brown was serving a sentence for burglary and attempted grand larceny. He grew up surrounded by crime, and was in and out of juvenile detention. He saw two friends, shot and killed. His father was incarcerated too. His mother worked two jobs. Brown: My mom did everything, she tried to do everything. She was a single parent, she was always gone and that left an opportunity for the streets to grab me. The community lacked resources and role models, says Brown. It was a hurtful place, he says, where people expected you to fail - or worse. Brown: I was always told no, you can’t do this, you’re not going to do this, you can’t achieve this. And I always proved them wrong, always. People said I wouldn’t graduate from high school, people said I would be dead, everything and I’m still here. For about a year, Brown says he was homeless. Then the burglary change resulted in a 16 month sentence, which he served in Henrico County jail. Conditions were horrible, says Brown. Brown: It would be like four people in one cell, two bunk beds, one on bottom, one on top. There would be two people sleeping on the floor next to the toilet. It was really traumatizing, it was really depressing. In states across the country, including Virginia, officials are recognizing the negative consequences of putting kids in facilities that resemble adult prisons. Places far from home with high fences, razor wire, small cells and concrete beds. Amy Woolard: These are facilities that should not be holding kids. Amy Woolard is an attorney and policy coordinator for the Just Children Program at the Legal Aid Justice Center. Woolard: What happens when we put them there, at least in Virginia, is when they come out recidivism rates go sky high. Around 75% of youth are re-arrested within three years of being released from a juvenile prison. It’s costly, with Virginia spending on average about $140,000 to incarcerate one youth for one year, according to Legal Aid Justice Center. And it disproportionately affects youth of color. The movement to transform Virginia’s system of incarcerating youth involves many including state officials, lawmakers and the Department of Juvenile Justice (DJJ). 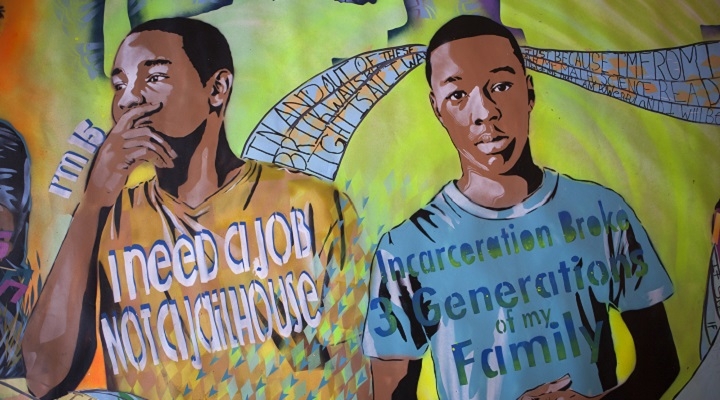 Campaigns like RISE for Youth and Performing Statistics are connecting families and incarcerated youth with decision makers and the wider public. The Annie E. Casey Foundation provided support to assess Virginia’s system and analyze alternatives, like the “Missouri Model,” that are smaller, treatment-focused and closer to where families live. At a public forum, Department of Juvenile Justice Director Andrew Block spoke about this transformation. Andrew Block: We’re working on three fronts and we call them the three Rs. Reduce, Reform and Replace. Block says progress is being made in all three. Virginia’s juvenile prison population dropped in half in two years, to about 275 today. DJJ is reforming how it works with youth and families, expanding treatment programs, engagement and re-entry services. And they are work to replace the two large, 200+ bed juvenile correctional centers. Beaumont is expected to close in 2017. A smaller, 64-bed facility is planned for Chesapeake. Block: From the moment a kid comes in through front door of our intake office to the moment they leave parole, if they get to that point, we are trying to get better. But even aside from the facilities, there’s a whole lot of other work going on that is important for everyone to remember. And we very much share the goal of probably most of you present of trying to keep kids in least restrictive environment and in their community and get them back on the right track as quickly as we can. Joining block was DJJ’s Valerie Boykin, head of the Community Services Division. She says the department is talking about prevention, and trying to return to initiatives that suffered from budget cuts, like halfway houses and the mediation philosophy “balanced and restorative justice.” They’ve increased video visitation and a few months ago, started a transportation program for families. A program with the DMV allows incarcerated youth to get IDs and learning permits. And they’re bolstering re-entry services including training probation and parole officers in a program called EPICS, Effective Practices in Community Supervision. Valerie Boykin: We have learned that just watching them or focusing on compliance does not work. We have to develop relationships with them, even though sometimes we have to wear that hat, I’m a court officer, I’m an official for the court. But we also know that relationships matter and having structured conversations that also teach them skills are important things for us to do as we’re working with people and families. Boykin: We are looking for new and innovative services that are evidenced-based or evidenced -informed, that means they understand what works and are applying some of those principles, if they have met the rigor of that full definition of evidenced-based. But also other services that are closer to home, rooted in communities that people want to try and see if what will work in your neighborhoods and communities and with your kids. There are community-based models that could be implemented across the state, says Legal Aid Justice Center’s Amy Woolard. One is the Youth Advocate Program or YAP, which operates in about 20 states. Roanoke’s had the program since 2009. Woolard: With YAP a young person is paired with a mentor and sometimes a team of mentors who really do act like big brother or a big sister or kind of a surrogate parent sometimes and plays all of these roles in a child’s life, is on call 24-7 and is sort of the best parts of what we would want a probation officer to look like and the best parts of we would want a parent or older sibling to look like or a coach sort of rolled into one. And there are goals set for the young person and I think they are realistic goals set. It’s a strengths-based program so it looks at different measures of progress a young person can make and should make and doesn't expect to have a hundred percent positive results all the time but expects improvement and sticks with a young person until that happens. Other models are Functional Family Therapy and Therapeutic Foster Care, intensive programs that get to the root causes of the problems and youth are experience. Woolard: There are some programs where kids would be in more of a residential type placement outside of the home but certainly not in a place with 12 foot razor wire fences and bars and covered windows. Earlier this year, the General Assembly approved a measure to let DJJ reinvest the savings from closing the large prisons. Operational costs at Beaumont are about $30 million, and a significant portion is slated to be put into a system of alternative programs across the state. But with budget shortfalls, there’s concern this reinvestment will be targeted. Woolard: This portion of the transformation, this reinvestment and building out this community continuum is the most important part of this entire transformation. Without it, all of the rest of it falls away and I think we lose tremendous, tremendous progress if we don't address that prong in the transformation. I think it's incumbent upon the lawmakers who decided on this back in 2016 to retain that commitment. We saw broad bipartisan support for the this reinvestment and I think that we really need to see lawmakers continue to commit to that reinvestment. W’e’re kind of at a fork in the road in our juvenile justice system and we can head down the same path and we can keep confing kids and we can send them right into the Department of Corrections which is what's happening in large degree now or we can choose to look at with the best data and the best research are telling us which is that when kids are connected to their families, when they're connected to their communities and when they're connected to their education and employment opportunities we don't see the type of re-arrest rates that we see when we're putting them in prison now. As diverse sectors come together to work on the transformation of the criminal justice system, Woolard says they’d like to see a redefining of what safety means, that it’s much more than than arrests and prison sentences. Woolard: Safety can really mean addressing what communities need, what their gaps are, so safety can mean things like after school programs and more sports and music and arts and making sure there are more counselors in schools. I would hope that as part of this transformation as we start to change the way we think about juvenile justice we all start to think differently about what safety can means so we’re not just injecting perception of safety into communities but we are actually having people feel safe and be safe because they’re getting what they need. Lessons can be learned from people like Marvin Brown. With the right resources and mentors, he’s thriving. He has his own apartment and through steady work, he’s paying off fines. He’s also a youth advocate with Legal Aid Justice Center and the RISE for Youth Coalition. He attends public meetings, speaks to lawmakers and working to change the juvenile justice system. Brown: I don't mind giving up my life to save my people, you know and I'm really dedicated to this. This is all I want in life, I just want my mom to be able to see this. I just love doing this type of work, it gives me a feeling that I’m doing something right. That’s how I want to feel, now I’m doing something right. Advocates say a critical part of the transformation is making sure formerly incarcerated youth and their families are at the center of solutions. Next week, we’ll learn more about these efforts and the evolving Performing Statistics collaboration between youth, police and the larger community. For Virginia Currents, I’m Catherine Komp, WCVE News. Photos of artwork and the discussion with Jeree Thomas and Andrew Block provided by Performing Statistics/Mark Strandquist.